Joshua Samuel Aaron, who was charged with the largest financial cyber-attack in America’s history, has been arrested at New York’s JFK airport. The 32-year-old American will appear in court on December 15. 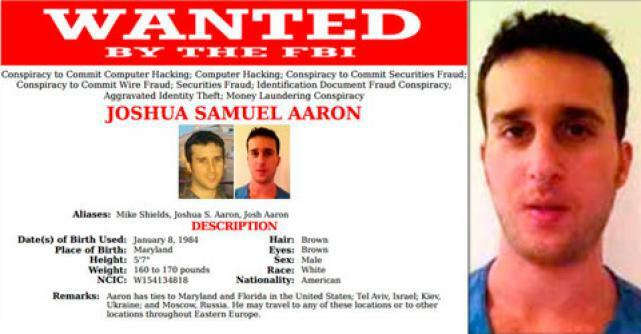 Joshua Samuel Aaron is one of three men accused of illegally accessing the personal information of 100 million people between 2012 and 2015. Twelve major financial institutions were victims of the hacking, including JPMorgan. Joshua Samuel Aaron had been a fugitive living in Moscow, but flew to the US voluntarily to face the charges, his lawyer said. The other two suspects are Israeli men: Gery Shalon and Ziv Orenstein. They were arrested in Israel in July 2015, and extradited to the US in June 2016. All three men were charged in November 2015. Joshua Samuel Aaron, Gery Shalon and Ziv Orenstein allegedly manipulated stock prices by selling shares of companies to individuals whose contact information they had stolen. The three men were also charged with running an illegal payment processing business that they used to collect $18 million in fees. Prosecutors claim the men hacked into competitors’ systems to spy on them and then hacked into a credit card company investigating their payment processing business in order to avoid detection. The company hit hardest by the breach was JPMorgan. More than 83 million of the bank’s customers had data stolen in the breach.